Price– At your local con. Gaming Stores can’t get this one yet! Basics- The kingdom is threatened and Arthur must ride out to face the threat! 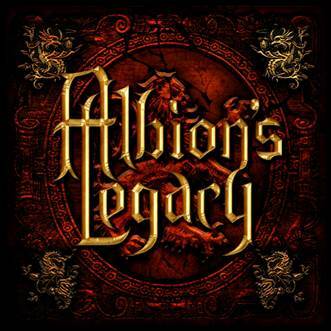 In Albion’s Legacy players take the rolls of various heroes (and in the expansion villains) of Avalon who must stop different threats to the kingdom. There is a lot to this game, but it’s also surprisingly simple to play. Players start by selecting a hero. Each hero has a power and a personal quest. The power is a constant power they have through the game, and the personal quest is a character specific goal that will grant the character their awesome ability or item that will make them that much more powerful. Each hero also gets a starter weapon and armor. These don’t do much besides block hits, so better items are a must. Players also get destiny points that are used in challenges (more on that later). Players then select a quest to go on. The quest is the way the players will win. Each quest outlines specific places the player must go, enemy’s to kill, and with the expansions adds extra enemies and locations for the players to visit. These describe how set up is modified as well. Players also select a start player who starts with a key token. This key token is used to keep track of the number of rounds the players have played as well as determining when the game itself take a turn to move all the enemies and effect the players as needed. After setup, players all start in the round table room of the Camelot board. Camelot has several different locations for the players to go, with all the different locations revealed. 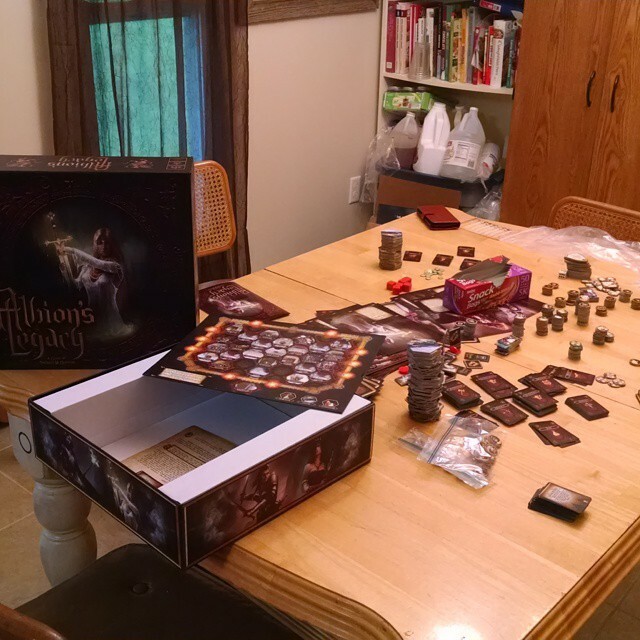 Starting with a key players, each player gets to move their characters around the board. The characters all start with a move of four spaces, but they don’t have to go all four spaces. For the most part, a character is free to move as many or as few spaces as they want. Characters only cause events to happen when they enter a space that has an encounter marker on it or moves onto an enemy’s space. Encounter spaces cause the player to draw an encounter card, and any time a character and a monster share a space, all other play stops and the character must fight the monster! I’ll discuss combat and monsters in a bit. Character can keep moving until they use up their movement either moving on known tiles, or revealing tiles for them to move on. 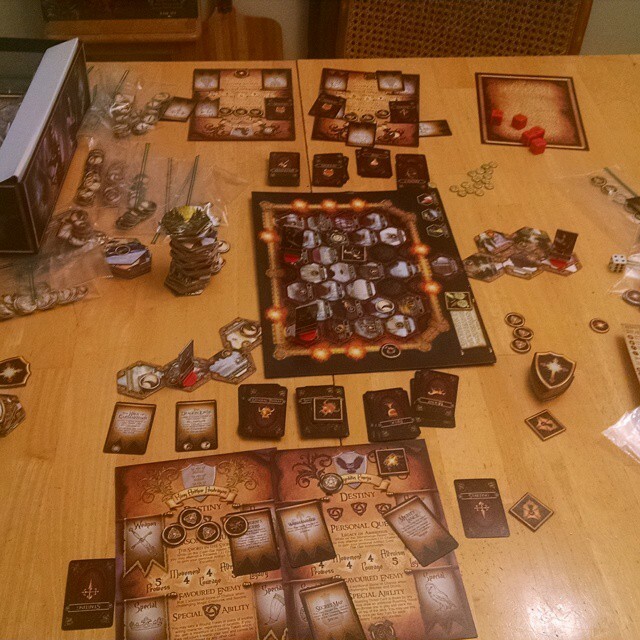 The player’s turn ends when they stop moving and they can elect to use the location ability of their space. These space abilities range from healing the character, repairing armor/weapons, getting new items, or other good effects. Combat is quick in this game. Each character has several knightly attributes ranging from courage, prowess, altruism, and so on. Every monster or challenge has different attributes that must be select for a combat along with a number of successes that must be obtained. After the player has selected their attribute, the player rolls the number of dice their character has for that attribute. These dice are six sided dice with five of the sides being the different attributes and the sixth being a mana burst which is worth two successes. A player rolls these dice and counts the successes. If the player succeeds, the monster is beaten or the challenge won. If not, the player now must make a few choices. The player can take a wound and continue the challenge, break (flip the card over) an armor or weapon and continue the challenge, discard a armor or weapon to flee combat, or spend destiny points to reroll dice. The destiny points allow a player to select a second symbol on the die, reroll one die, and see how the combat progresses with the player winning, spending armor/weapons, or taking damage. It’s quick, simple, and VERY deadly as most characters only have one damage! Take your second damage, and your player retires out of the game and you have to take a second (or third or more!) character. After all players take their turns, the key player gets a second turn. When they finish their second turn, the monsters all have their turns. Most monsters move, a brazier is extinguished, some events trigger, and the key marker moves to the next player. Then play continues as above. When the players finish their original quest, they win the game! If they last virtue plaque is removed or last brazier extinguished, they Kingdome descends into darkness, and the players have lost!